The following day, God blessed me. He orchestrated a meeting between myself and this woman. I spent the evening contemplating her challenge and wanting to encourage her, but I didn’t know her name! At the first workshop I attended, I followed my new friend Brenda and took a seat. Right next to me sat the woman from the dinner! Immediately, I thanked her for her message and asked her name – Leslie. I told her I would be participating in the challenge and blogging about it. We had a wonderful conversation, and I gained a friend. She initially posted this on her own blog, which you can read here. Friends, why is this so difficult for us? I’ll tell you why. This world tells us confidence equates to arrogance. The Bible calls us to be humble. Understand this: there is a difference between confidence and arrogance, between confidence and pride. I asked my 10-year old daughter this question, and she gave me a funny look. “Mom, isn’t that kind of . . . braggy?” I explained: knowing and owning our God-given unique qualities and strengths is not bragging. It is understanding our gifts so we can utilize them. How can we make an impact on God’s Kingdom if we don’t know our own strength? The enemy has whispered so many vicious lies to us, and it may be a real struggle to come up with five. But it shouldn’t be. Friend, YOU are beautiful. YOU are unique. YOU are chosen. YOU have a specific purpose here on this earth. YOU were fearfully and wonderfully made. Hold tight to that. And ladies, let me also challenge you with this: we are all royalty. We are daughters of the One True King. 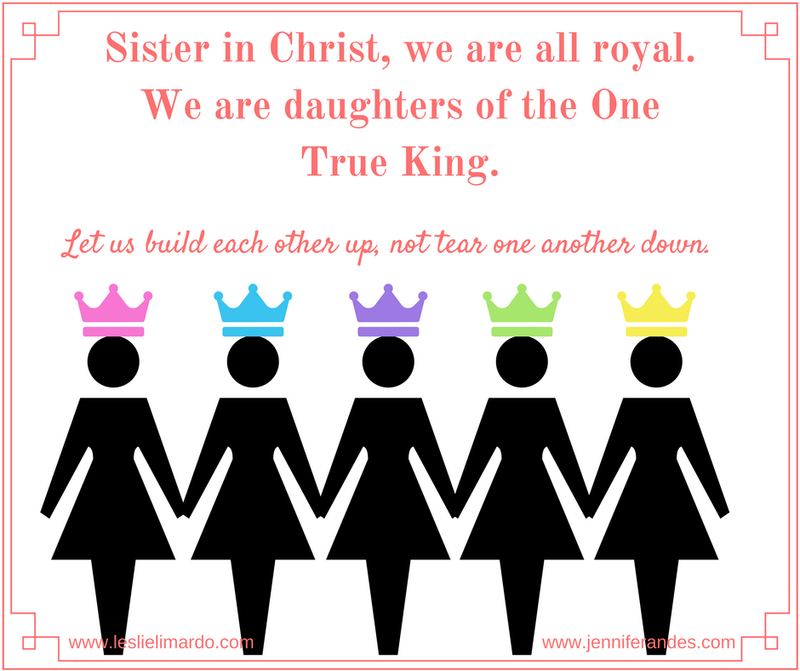 We are sisters in Christ! Let us stop tearing each other down and start building one another up. Never in my life have I experienced so much encouragement from so many strangers as I did at She Speaks. If that kindness and grace were extended by every one of us in the real world, the impact would be earth-shattering. So let’s break the mold society created. Let’s stop believing the lies of the enemy that we are in competition with one another. Let us embrace our uniqueness and celebrate the gifts of others. We are not arrogant in doing this; we are honoring the God-given qualities that make us us.